It's all gone very quiet on the art front in this house! Henry William was born on the 27th November, 8lbs 14.5oz. 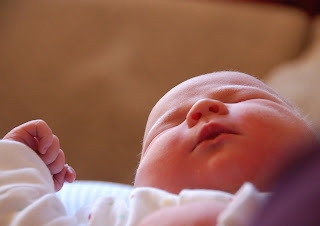 I was lucky to have a fairly quick and straightforward waterbirth at home; we are all doing really well and very much enjoying the new addition to our family! Late pregnancy has seen me slump deeper and deeper into my sofa these last few weeks so I haven't been too productive on the painting front! However, I will be springing into action to attend the Yarm Originals Exhibition in Eaglescliffe on Sunday, bringing with me original work available for sale. A variety of local artists will be there offering a wide range of art and photography so it should be a great afternoon and an opportunity to do a bit of Christmas shopping! None of my commissioned paintings were dry enough to work on today so I took the opportunity to make a start on my next original piece. 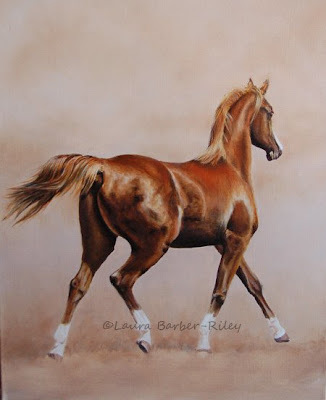 This is 12" x 16" (30cm x 40cm) oil on canvas, and based on photographs that I took of part-bred arabs showing in hand at the Northern Arabian Horse Show in July. 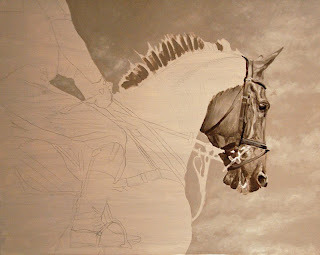 The horse is a dark bay colour so I am using a mixture of raw umber and ivory black for the underpainting, along with titanium white. So far I have just very roughly sketched in the main areas of light and dark. As usual I have given no thought yet whatsoever to how I'd like the background... I never learn. 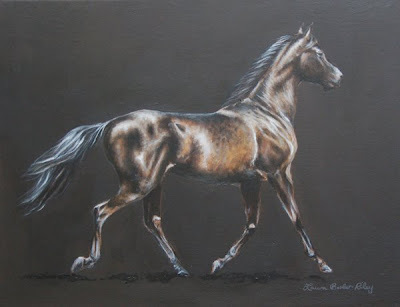 All three entries accepted into the Society of Equestrian Artists Newmarket Exhibition! I'm very pleased that all three paintings that I submitted for the Newmarket SEA exhibition were accepted today; 'Rocket Science', 'Arabian Filly', and 'Cooling Down' will now be on display at Palace House, Newmarket, from the 1st-17th October. The exhibition will feature a variety of equestrian artwork from a wide range of artists. I am disappointed not to be able to go and see it myself (bit too close to my baby's due date for an 8 hr round road trip!) as it promises to be a really excellent exhibition! 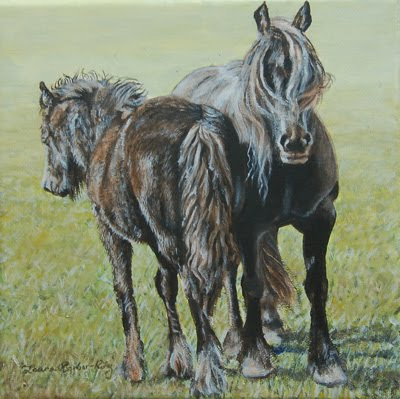 In addition to the 100s of beautiful original pieces available for sale there will also be a sale of charity postcards at the exhibition, raising funds to help support paraplygic rider Debbie Hounsome to compete at the 2012 Paralympics. Postcard sized original work in a range of media will be on sale for £30 each- an absolute bargain and a great cause too. Entry is free of charge, the exhibition is open Monday to Friday 10am-5pm, and Saturdays 10am-1pm. The Society of Equestrian Artists Newmarket Exhibition takes place from the 1st of October through to the 17th October at Palace House. 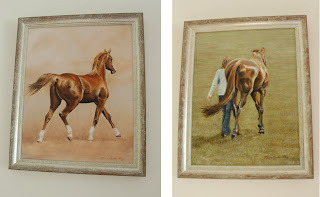 In addition to 'Rocket Science' which will be appearing there, I have also submitted a further two paintings pictured above which will have to go through the selection process there next weekend- 'Arabian Filly', and 'Cooling Off'. 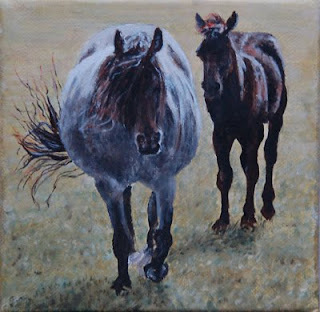 Unfortunately I am a bit too weeble-like to make the 8hr round trip to Newmarket from here to attend the handing in day so Parcelforce are delivering my work to fellow artist Stephanie Greaves who has very kindly offered to sort things out for me at that end. I nervously await to hear that my paintings have arrived safely after spending a long time packaging them amongst much polystyrene and bubble wrap this morning! Please keep your fingers crossed that both Steph and I successfully get some of our work past the judging panel and into the exhibition! I always forget to update my websites with commissioned work as there is often a gap between finishing it, and the recipient recieving it as a birthday or Christmas present! 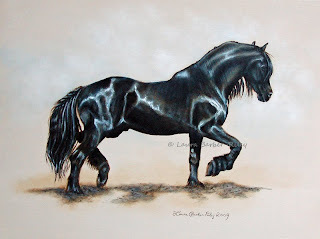 This is a recent portrait I did of an incredibly beautiful Friesian stallion. It was quite a challenge as the main reference photo I was working from didn't contain a huge amount of detail and was a little bit blurry; however the pose was such a striking one I could see exactly why the client was keen to use it and with the help of some good quality back up photos I managed to get it done! Charity postcards, Yarm Originals, and other bits and bobs! I have no works in progress to share at the moment as I'm snowed under with birthday/Christmas commissions and I wouldn't want to spoil anyone's surprise! The Society of Equestrian Artists have asked their members to donate postcard sized work to be sold at their Newmarket exhibition in October, so I have recently completed my smallest painting ever, a tiny 5" x 7" oil on canvas board. 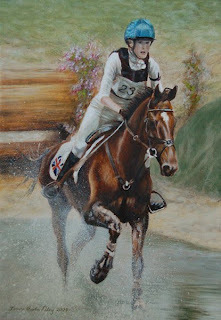 The fundraiser is looking to raise money to support paraplegic rider Debbie Hounsome in her aim to compete in the 2012 Paralympics; all postcards will be for sale for £30 each at the exhibition- a great way to support a worthy cause AND grab yourself an original piece of artwork at a bargain price too! The exhibition takes place at Palace House from the 1st to the 17th of October. I have found it a real challenge to get my work seen locally so I'm really excited to now have some of my original paintings available for sale on the Yarm Originals website. In addition to displaying the work of a number of local artists and photographers in online galleries, Yarm Originals also run exhibitions featuring work for sale which I am very keen to get involved in. The next exhibition looks likely to be around November time, perfect timing for people looking for Christmas presents but potentially bad timing for me on the new baby front given I am due in November... we shall see! You can keep an eye on forthcoming Yarm Originals news at Janice Foley's blog here. In between painting I have been busy preparing my huge canvas for my next big project. Lots of layers of gesso going onto the linen to hopefully create a lovely smooth surface to paint lots of tiny details on. 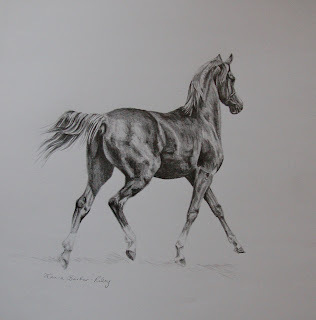 I am longing to get started but the need to get peoples' commissioned Christmas presents completed before the new baby arrives means it must wait! Another finished painting, just in time to get my entry form off for the Society of Equestrian Artists Newmarket Exhibition which takes place in October! 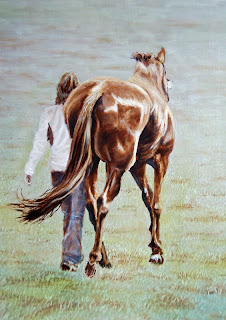 'Acquiescence' has now been reserved so I shall be entering 'Rocket Science' (which is automatically accepted having been displayed at the Annual Exhibition in London), plus 'Arabian Filly' and this painting which will both need to get past a panel of exhibition selection judges in order to be included in the exhibition. Fingers crossed! A bit more done on this one here and there. 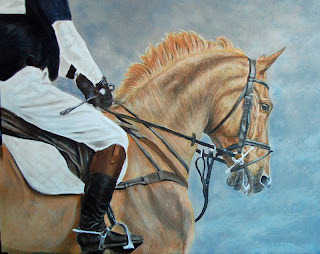 Quite pleased with it so far, just lots of tidying to do on the horse and handler now, and the grass to sort out... I hate painting grass! This isn't a great photo of it, for some reason I am finding it really hard to get decent photos of my paintings recently! 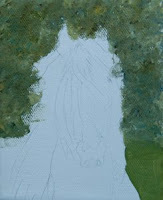 I have started a new painting but I'm not getting anywhere fast with it as most of my (limited!) 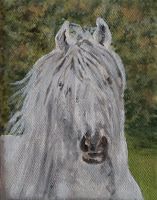 painting time is being taken up with commissions at the moment. Managing to get bits done here and there! I'd like to enter this one for the next SEA exhibition in Newmarket but time is tight... will have to decide whether or not I'm likely to be happy enough with it by the end of the month before the entry deadline! So far I have completed the underpainting and added the first thin glaze of colour.... because I have been working in tiny bursts I haven't really kept much of a photo record. 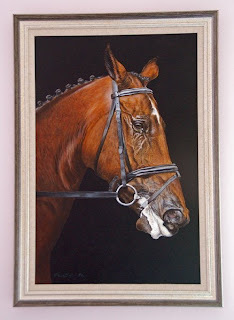 The painting is based on some great photos I got of Rosie Thomas's horse Barry's Best being cooled off at Badminton this year; it is oil on linen 18" x 14". I had a wonderful day out photographing beautiful Dales ponies at the Nipna Dales Pony Stud on Tuesday. I'm quite excited about a lot of the reference material I got! After promising myself to paint on smaller canvases after the trauma of lugging big paintings to and from London (not to mention the framing costs!) 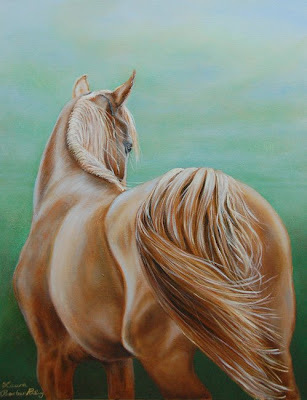 I succumbed to the lure of a 36" x 28" linen canvas (the biggest I have ever attempted) which I intend to paint ponies on! I now plan to start a really big detailed project to keep me slowly ticking over without any pressure during the winter months once our new baby arrives. I'm still not totally happy with it (am I ever?!) but for now at least, I'm calling it done and have signed it. May go back and fiddle about with it with fresh eyes in a few months! 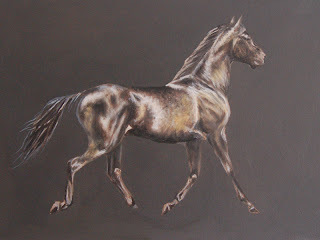 Struggling to fit my own work in with the commissions I have on the go at the moment but may start something small as I'm keen so enter something new into the SEA Newmarket exhibition which closes for entries at the beginning of September. Almost there! Quite a bit of tidying up left to do on the tack and rider but the horse is pretty much done. I'm not totally happy with it and think I will be a little bit disappointed with the end result but have got to the stage where I'm starting to make things worse not better so time to call it a day I think, and move on to the next project. The sky has much more blue in it in real life, for some reason the camera doesn't seem to be picking it up. Hopefully I'll get it finished tonight and then be able to post a photo of the finished painting tomorrow when the light is better. I usually traipse around the house and garden with the painting in one hand and my camera in the other, photograph it in as many different places as possible and then pick the photo that looks most like it! 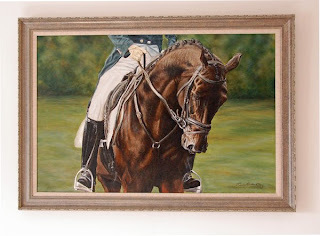 Amazing the difference between the photos I end up taking, accurately photographing oil paintings is so difficult! 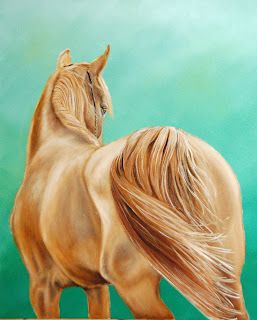 Some more colour on the horse and sky today. Bottom photo is this mornings work, the one above this evenings- I get 2 slots a day to work in: my toddler's daytime nap, and once he goes to bed! Getting there gradually with this painting and I'm pleased he is starting to look a bit richer in colour- lots more to do though! First colour glazes on today! For the glazes I scrub neat oil paint into the canvas over the underpainting, the paint is spread thinly enough to see the underpainting underneath, I then go back over picking out highlights and shadows ready for the next glaze to go on once it's dry. The first glaze earlier today was a gold ochre (photo below) which spread thinly looked a horrible mustard colour... some red ochre was glazed over the top this evening (photo above) and the main highlights picked out again. At this stage the colour looks washed out and lack-lustre; as more and more glazes are applied over the top it *should* become much richer and deeper in colour with more and more depth. Fingers crossed! Another layer onto the underpainting today. I should probably spend a little more time tidying it up but I'm impatient to get on with the colour so knowing me, it'll have the first glaze of colour next unless I spot anything glaringly wrong that I need to correct first! The first rough layer of underpainting is now finished, from here once dry I'll continue working on the underpainting until it essentially looks like a black and white version of the final painting- lots more work to do on the underpainting before any colour can go on! I have managed to make a start on a new original painting this week; it is based on a series of photographs that I took of William Fox-Pitt entering the cross country warm up area on the very beautiful Idalgo at Badminton Horse Trials this year. 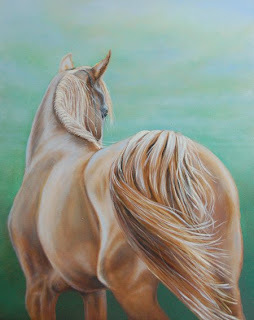 The painting is oil on canvas, 20” x 16” (50cm x 40cm). 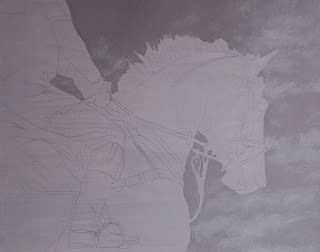 The canvas has been gessoed and sanded many times to provide a lovely smooth surface to work on, and a few layers of thin paint applied over the whole thing before the drawing went on. I'm currently working to complete the first layer of the single tone underpainting, which will form the basis of the painting over which layers of colour will eventually be applied. 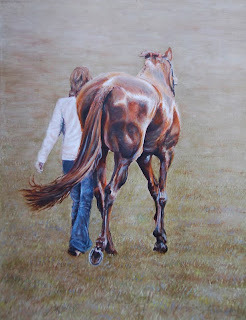 On visiting the Society of Equestrian Artists Annual Exhibition this weekend I was absolutely thrilled to discover that 'Acquiescence' had been awarded The Ingleton-Beer Associates Prize for best picture of horse and rider! We had a wonderful time at the exhibition, which featured some incredibly beautiful work. 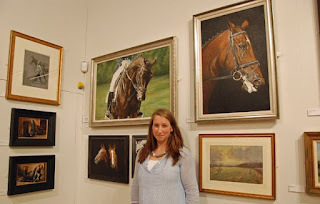 It was a huge honour to have my paintings hung amongst the work of many many equestrian artists that I have admired for such a long time. The next SEA exhibition is scheduled to take place in October, in Newmarket. Went back to this this evening and have managed to finish it! Can't think of a good title but I am very pleased with it and will definitely use the grisaille technique again as I found it really suited my way of working. Another layer of colour on today and a better photo of the painting. 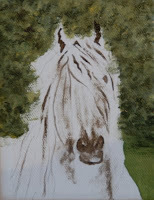 I don't think there is actually a huge amount of work left in it now, I am a little wary of overworking it! 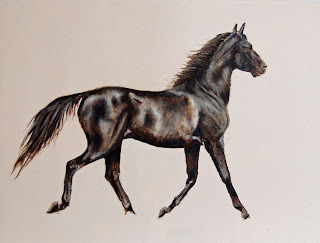 Once it has dried I think I will try and pick out the deepest shadows (I think the hindquarters have lost some of the definition I liked) and touch up the brightest reds etc and then see how it looks. Also need to decide on the background, still think I will keep it very similar to how it is now, just a bit more refined. Braved the first glaze of colour today! 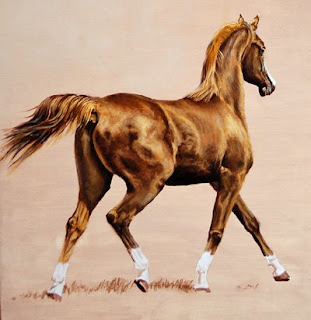 Was not sure where to begin with the colour so applied a layer of gold ochre to the whole horse to act as a kind of base colour to build up. Quite pleased with the result, looking forward to getting more glazes on now once it has dried. 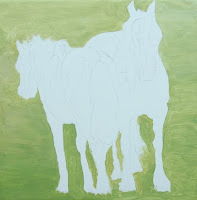 Second layer of paint on the underpainting. 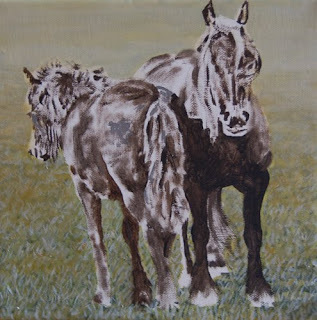 This is my first attempt at a grisaille oil painting. The basic idea in a nutshell, as I understand it, is to produce an underpainting mapping out all of the tones, before then applying thin glazes of colour gradually to produce the finished result. Before starting I took much more time than usual preparing a canvas. Layers of gesso were applied, and then sanded down, and then reapplied, to eventually achieve a smooth surface to work on. Once I had my smooth surface I then applied several coats of thin oil paint as a base, or imprimatura. So far I have my first layer of paint down. My underpainting will be produced using only white, and burnt umber paint, with possibly some ivory black mixed in to pick out the darkest shadows later on. I actually found the smooth surface quite tricky in some ways- this first layer was competed wet on wet and it was quite slippy! I was limited in terms of how much I could do as brushstrokes ended up taking paint off the canvas rather than putting it on if I wasn't careful. 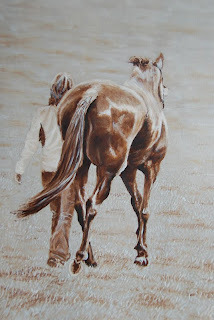 I plan to continue to work on the underpainting in layers until it represents a finished tonal version of the painting; having gone to all the trouble of preparing the canvas I am keen to really achieve high levels of detailed accuracy before thinking about applying the coloured glazes. Work accepted into SEA Annual Exhibition! I am currently sat on the train with the biggest smile on my face travelling home from London having taken two paintings, 'Acquiescence' and 'Rocket Science' all the way to the Mall Galleries to go before a panel of judges. 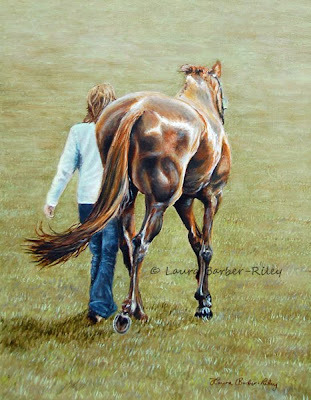 I am absolutely over the moon that both paintings have been accepted into the Society of Equestrian Artists Annual Exhibition! Was great to catch up with fellow equestrian artist Sally Lancaster over lunch whilst we awaited the decisions; Sally's fantastic paintings will also be appearing at the exhibition. I have decided to call it a day on this one before I spoil it! 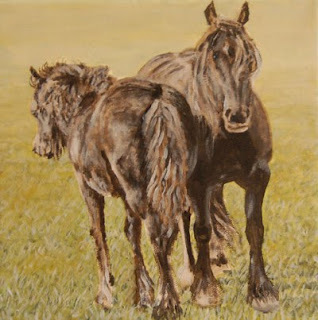 It is so much softer and looser in style than my usual work, I think if I tried to add the nitty gritty detail it will lose some of it's character and atmosphere. 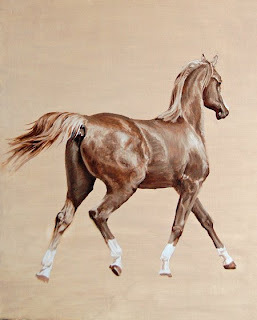 I have titled it 'Arabian Innocence'. 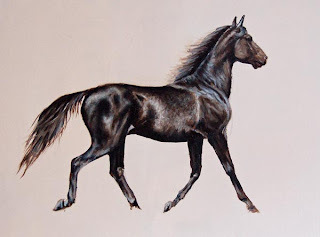 I was quite pleased with it until my unhorsey husband pointed out that it's back leg looks like it has been deformed, twisted, broken and is now dangling awkwardly... quickly following the comment up with "...but it looks exactly like the photos so that's fine." Great, thank you for your input B. LOL! I'm in the process of gessoing and sanding the canvas I plan to use for my attempt at a grisaille. It's slow progress, I'm on about the 5th layer of gesso now and I think after another few sanded layers I should have a beautiful surface smooth enough to paint the finest of details on. Can't wait to get started! I'm finally happy with the background! I had planned to change it totally but messed about with it to try and hint at sky in the top bit and was quite pleased with the result so will leave it as it is now. 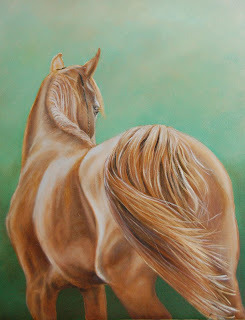 Got a little more done on the horse too today. Just fine detail left to go now really and smudges of colour here and there once this layer dries. Some more done on this today. Fiddled about with the background a bit but I'm still not happy with it! 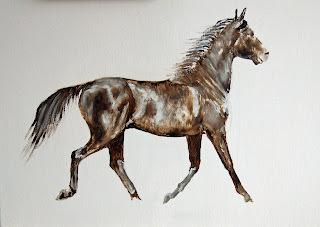 I have decided to start another Arab painting too, this time of a Crabbet youngster. I plan to attempt a grisaille for the first time which, in simple terms, involves a detailed single tone underpainting which coloured glazes go over the top. I haven't worked in black and white since I was at school so thought I would practice some pencil sketches before I put paint to canvas!